Growth is about finding new channels. Messaging in general as a channel is young and fresh – and there will be a goldrush very, very soon. Services like Slack and Facebook Messenger are following the lead set by the asian chat successes like Line and WeChat in turning chat into a platform that allows access to services over the top – services like payments, shopping, games and more. You can now order an Uber by typing a command in Slack, or you can order a pizza within the WeChat app in China. What happens when chat becomes our interface with the world? Before the point-and-click windows-based GUI evolved, the earliest PCs running DOS or similar operating systems had a ‘chat-style’ interface – a command line. Messaging could be the next Operating System, and the starting point could be, once again, the command line. The difference is this time the abstraction level is much, much higher. Instead of a command like cd /uber which would change your working directory to the one called ‘uber’, now a command like /uber ride can literally order you an Uber. What’s old is new again. There is a big possibility chat will be the next user interface. Chat – or personal assistants – or more likely a combination of both – will replace the apps grid as the next major UI paradigm. The chat window is always open. Yes, you use it to talk to your colleagues or friends – but it is already replacing email, and will piece-by-pice replace everything else around it. It’s so much easier to order an uber by typing “/uber ride” into the chat window that’s already open, than pulling your phone out, unlocking it, opening an app, etc. I did a presentation at the ProductTank Berlin February event last night. My slides are available here. 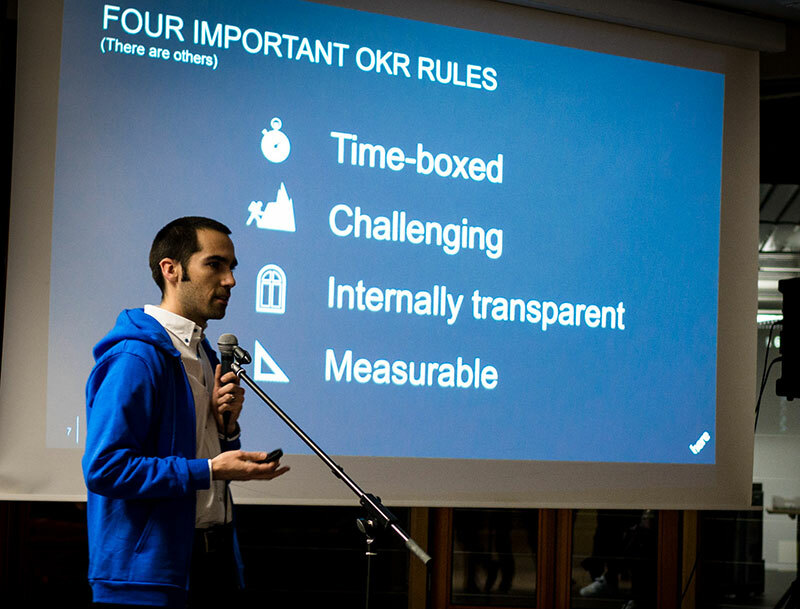 I’m happy to chat more about OKRs, and how we work. Contact me!